The three philosophical questions with which we are concerned in this chapter are not all equally difficult. The first and least difficult question is whether the material things of the physical world are also immaterial in some respect. More difficult is the question whether the existence of the human mind introduces an element of immateriality into a world that is otherwise material. Finally, and most difficult of all, is the question whether the universe includes a being or beings wholly immaterial. The reader who remembers what was said in chapter 8 will have some clue to the answer that Aristotle gave to the first question. We saw there that all the changing things of physical nature are composed of matter and form. We understood this in terms of works of human art. The artist or craftsman takes materials that can be formed in one way or another and produces a work of art by transforming the materials he works on—giving them a form they did not originally have. The wood that becomes a chair as a result of human productivity takes on a form—the form of chairness—that it did not have before the maker transformed it. have many different shapes, but whatever shape they have, they are all chairs. It is the form, not the shape, that makes all chairs of different shapes the same kind of thing. That form was an idea in the mind of the maker before it became the form by which he transformed the wood into a chair. Having that idea, the maker understood the kind of material thing he wished to make. As the idea in the mind of the maker is an understanding of the kind of thing to be made, so the form in the materials transformed by the maker is what makes it the kind of thing that is made. Weather they are products of human art or natural rather than artificial things, all material things have an aspect that is not material. Form is not matter; matter is not form. Things composed of form and matter have an immaterial as well as a material aspect. unformed matter—cannot exist. The forms that matter can take actualize its potentialities. Lacking all form, matter can by itself can have no actuality; and what has no actuality does not exist. that the only existence they have? Can they also exist apart from the matter of things that are composed of matter and form? Aristotle’s answer to that question is affirmative. Once more it is necessary to remember something said in an earlier chapter. In chapter 16, I pointed out that, according to Aristotle, the human mind understands the kind of thing that a chair or a tree is by having an idea of it. Having an idea consist in having in the mind the form of the thing without having the matter of it also. The point just made relates to the difference between mind in its activity as knower and mind in its activity as producer. understands the kind of thing a tree or a horse is. eat (take food into our system and digest it), we take both the matter and the form of the composite thing that gives us nourishment—an apple or a potato. As Aristotle saw it, the reason why the apple or potato that we eat gives us nourishment is that when we digest and assimilate it, we transform its matter. Nourishment involves the assimilation of the food we eat. Assimilation occurs when matter that had the form of an apple or a potato loses that form and takes on the form of human flesh, bone, and blood. That is why we must take into our own bodies both the matter and the form of the material things from which we seek nourishment. If knowing were exactly like eating, we would never be able to understand the kind of thing an apple or a potato is. To understand the kind of thing an apple or a potato is, we must take the forms of those composite things away from the matter that they form. In assimilating edible things, we must separate the matter from the form and replace the form the matter had by the form of our own bodies. separate from matter. Only as separate from matter does the form become an idea in our minds, an idea by which we understand the kind of thing an apple or a potato is. Why? This is the difficult question that remains to be answered. 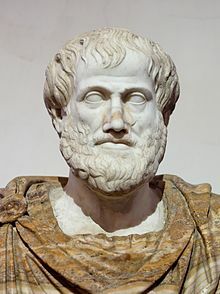 Aristotle’s answer turns on a distinction between the kind of thing a potato or an apple is in general, and particular potatoes or apples, each a unique thing. This particular apple that I have in my hand is the unique thing it is because the form, which makes it an apple, is united with this unit of matter that makes it this apple, not that one over there on the table. That one over there has the same form in a different unit of matter. The different units of matter that enter into the composition of two individual apples is what makes them different individuals. The form that each of them has is what makes them both apples—the same kind of fruit. understanding apples in general, not this or that individual apple. In Aristotle’s view, we can perceive though our senses the individuality of this or that apple, but we cannot, through the ideas we have in our minds, understand its individuality. Only kinds in general are understandable, not individuals. That is why the mind, in its understanding of kinds in general, must separate the forms of material things from their matter and keep those forms separate as the ideas by which we understand. That is also why Aristotle called the mind the form of forms—the place where the forms of material things can exist apart from their matter. We have now reached Aristotle’s answer to the second question stated at the beginning of this chapter. Does the human mind introduce an element of immateriality into a world that is otherwise material? Yes, Aristotle said, it does. If the mind were not an immaterial element in the makeup of human beings, it would not give us the ability to understand material things by separating their forms from their matter. And if the mind did not keep or hold the forms of material things separate from their matter, we would not have the ideas by which we understand kinds in general—the kind of thing a potato is as distinct from the kind of thing an apple is. To keep or hold forms separate from matter, the mind itself must be immaterial. If it were material, the forms would be kept or held in matter, and then they would no longer be ideas by which we understand kinds in general. a little better. Sensing and perceiving are one mode of knowing. When we sense and perceive individual things (this or that apple), such knowing involves the action of our sense organs and our brains, which are material elements in our makeup. Understanding is a different mode of knowing. By sensing and perceiving, we know this or that individual thing. By understanding, we know the kind of thing in general that this individual thing is. Unlike sensing and perceiving, such knowing does not involve the action of any material organ, not even the brain. Seeing is an act of the eye, but understanding is not an act of our brain. It is an act of our mind—an immaterial element in our makeup that may be related to, but is distinct from, the brain as a material organ. These are Aristotle’s answers to the first two of the three difficult philosophical questions with which we began. The third and most difficult question—about the existence of a totally immaterial being—will be answered in the following chapter.